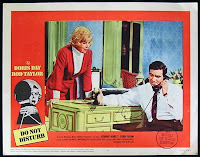 DO NOT DISTURB is a disappointing Doris Day movie which finds Doris and Rod Taylor playing Janet and Mike, a perpetually battling husband and wife who have relocated from the U.S. to London. Things go from bad to worse when Mike ignores Janet, then suspects her of having a fling with an antique dealer in Paris. Can this marriage be saved? It's always a pleasure to see Doris on the screen, but the movie has a weak script and poor production values. Janet and Mike are at odds from the beginning of the movie, which means viewers have no insight into what brought their characters together or the romantic chemistry they might have. Other than one very brief love scene, they are constantly bickering -- over where to live, how to get to the train station, his secretary, and on it goes. Any money put into the film certainly didn't go on the screen. The movie was set in London but the actors didn't leave the backlot. The establishing shots and back projections wouldn't be too bad, if only the exterior of Doris's British country house wasn't so obviously filmed in a soundstage. The movie also uses obvious "cheats," such as the scene where Doris holds a fox while scolding a pack of hounds -- which are never seen in the same shot with Doris and the fox. This kind of thing can be charming in movies of an older, more innocent era, but in 1965 it just looks like a poorly made sitcom on a shoestring budget. Doris and Rod do what they can, but are at the mercy of their script, which among other things forces us to sit through an extremely prolonged drunk sequence with Doris. The pace does perk up a bit towards the last 20 minutes or so of the movie. Supporting appearances by Reginald Gardiner (his last movie) and Hermione Baddeley help liven things up. As a side note, Doris is saddled with wearing a ghastly-looking purplish jockey's hat in one blessedly brief scene. I know it was the '60s, but what were they thinking? DO NOT DISTURB was directed by Ralph Levy. It was filmed by Leon Shamroy. The movie runs 102 minutes. This movie is available on DVD in a nice widescreen print. The DVD includes several featurettes. Previous reviews of Doris Day movies posted here: MY DREAM IS YOURS (1949), IT'S A GREAT FEELING (1949), THE WEST POINT STORY (1950), THE TUNNEL OF LOVE (1958), IT HAPPENED TO JANE (1959), and PLEASE DON'T EAT THE DAISIES (1960). Doris Day fans will want to check out DO NOT DISTURB at least once, but it ranks in the lower tier of her fine movie career. So often I envy you and the movies you view; this time, however, I'm glad I wasn't the guinea pig. This movie sounds terrible! My kids have recently discovered Doris Day and you have done us a great service by sparing us from viewing this one. Thanks and sorry you can't get those 102 minutes back. Thanks, Mrs. HH. I figure at least now I'll know what the movie's like when I read about it in books on Doris (grin). The other Day movie I recommend keeping at the very bottom of your viewing list is THE TUNNEL OF LOVE. I'm so delighted your kids have discovered Doris Day! She's wonderful. My favorites include CALAMITY JANE, ON MOONLIGHT BAY, BY THE LIGHT OF THE SILVERY MOON, PAJAMA GAME, THE THRILL OF IT ALL, and MY DREAM IS YOURS. There are many other good titles including PILLOW TALK, IT HAPPENED TO JANE, TEACHER'S PET, and more...even a Hitchcock movie (THE MAN WHO KNEW TOO MUCH). The vast majority of her films are on DVD. Enjoy!! The one that left me with a nasty taste in my mouth after the only time I saw it was Love Me Or Leave Me - and not because of Doris Day's character but that of her co-star. I'll never watch it again. Strangely enough it seems to have been a favorite with audiences - I'm glad it doesn't appear on your list of favorites.